Nice shot David. Perfectly composed. 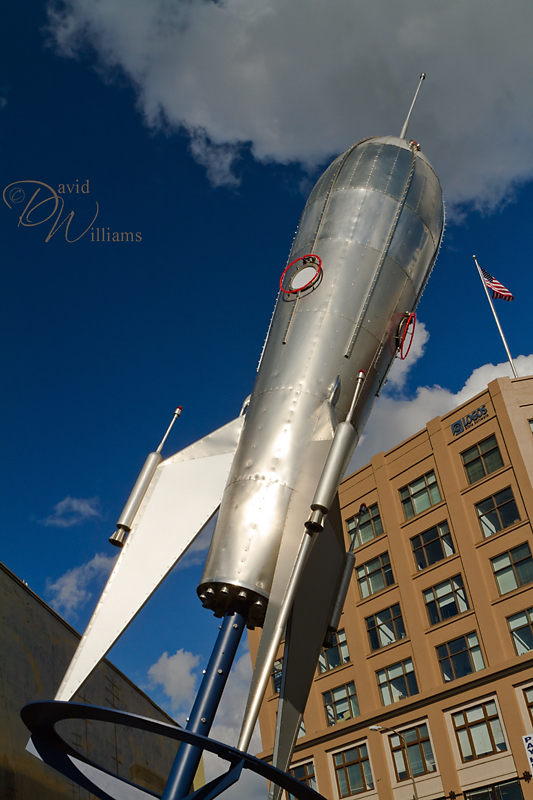 I think those blue sky in the background has aided the rocket stand out in this shot. I would agree with you Sasi, thanx. The rocket is too real…. the truth is out there! Great shot, I love the composition, all the strong angles and lines add a lot of visual interest. Hahaha, Cait love that show! Thank you for the comment Jim. Fabulous perspective and great framing. I like how it seems like the rocket is about to take off into that dark cloud. 🙂 Cait and I had a great time with you guys, thanx again! Good shot. I think the rocket is real – those guys in the car were part of a conspiracy to keep the secret. Hahaha, I think you nailed it Mike!